Steps to nowhere: Mysterious stairs at the summit of Stinson Mountain! We are watching an enormous Leopard slug ooze its way down the side of a rotting maple. The sight is particularly fascinating as the tree has apparently died from a lightning strike, the split branch still charred black and flaky. She’s repulsed by the four-inch, slimy creature, but doesn’t want to leave. We’re nearly a mile up the Stinson Mountain Trail. The day is warm but breezy. We’re both feeling strong. We have nowhere to be and plenty of time to get there. So, I just shrug off my daypack, get out a snack, and together the girl and I settle back to watch a slug crawl across a tree. And I think to myself, yeah, this really is the life. With global warming in full force on Sunday, the pull of the mountains was too great to resist. It had been five months since Janelle and I had hit the trails, and to say we were eager for some views would be an understatement. So eager, in fact, that even a prior commitment on Sunday afternoon could not keep us away from Mt. Monadnock. I had wanted to save Monadnock for a later date, but the fact that it was the only mountain on the list we could reach in the time we had made me change my mind. I worried that it was a little early in Janelle’s experience to tackle a 3,000-footer, but the perfect blue-bird day was too glorious to miss. Still, we had to wake up at 4:30 a.m. to have enough time to climb this lovely and popular mountain. You’d think that waking up a 9-year-old at that hour would be a Herculean effort, but so excited was Janelle to do this climb that she slept in most of her hiking clothes and gulped down her morning Cheerios standing up so she could get on the road faster. It was the earliest she had ever woken up (which to a kid is really like staying up late, so I understand her excitement). Another bonus of such an early day: We had Monadnock nearly to ourselves all the way up, through morning mist, low-lying clouds and even a sunrise. As those familiar with Monadnock know, climbing this mountain can sometimes feel like being in a city bus station — droves of hikers of pretty much every level of readiness (including none) attempt to haul themselves up Monadnock. Indeed, on the way down, we came across all level of hikers. But the way up was glorious. High spirits. Beautiful warm day. A variety of terrain – rock, mud, ice, snow. The girl was in her element with so much rock, bombing over the ledges, practically bursting with energy at the rock scrambling opportunities. At the summit of Mt. 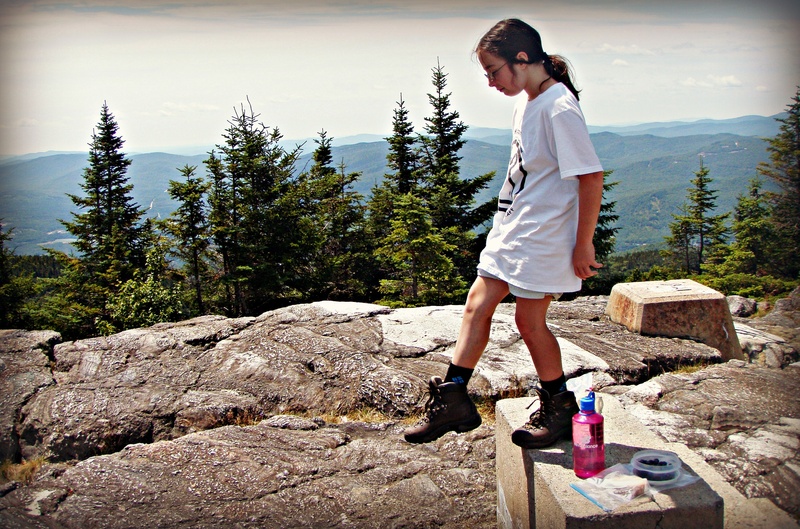 Monadnock, Tough Cookie’s first 3,000-footer! It occurred to me that I’m behind the curve here. My hernia surgery took more out of me than I had thought. I will only be able to keep pace with her for a while longer if she continues like this. I don’t have much time left to teach her; soon I’ll be the student. She surprised me in two ways on this climb. First, as we sat, nearly alone at the summit after a casual three-hour hike up, she mentioned that sitting at the summit sipping raspberry tea had become her favorite part of our hikes. It pleased me to know she was developing her own rituals — to me, crucial way-marks on any hike. Second, I believe I witnessed the birth of a peakbagger. 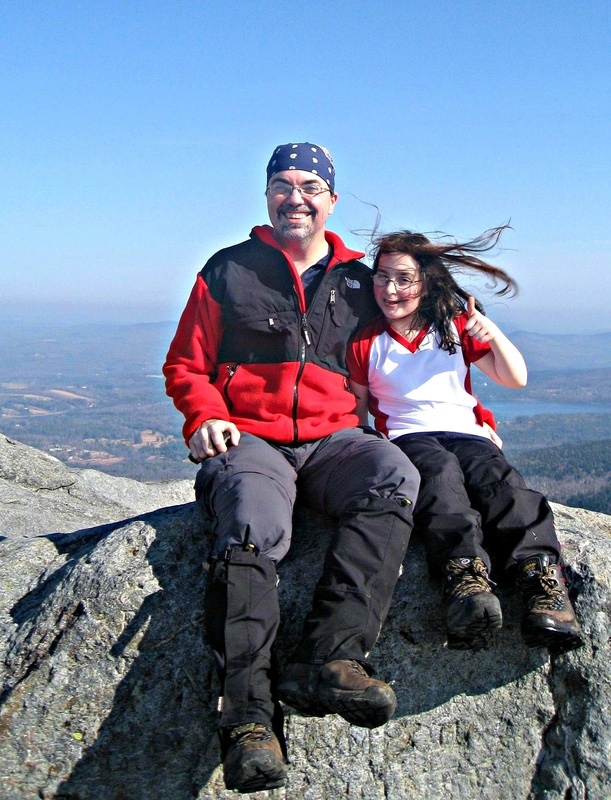 Monadnock was our first hike up a mountain that involved more than one trail. We took the White Dot to the White Cross. On previous hikes, one trail led to each of the summits. Here, Janelle spent a lot of time asking me odd questions like “Where does the mountain start?” and “Why is there more than one trail?” before I realized that in her experience thus far EVERY trail led to a summit. “Can’t we just take the trail that goes to the top?” she asked. A learning moment, and the birth, I think, of the peakbagger in my new climbing partner. The way down was more eventful, with a series of brush burns and bruises to accompany what by then was one tired little hiker. But we stopped to rest and eat often, and celebrated those bings and bumps like the badges of honor they were. I also took some weight out of her pack and before long she was literally skipping back to the car. It was the first time in five months that I was back on the trails, and the first time ever that Janelle had attained 3,000 feet. Every hike for us now is a learning experience of one sort or another, and we continue our path to getting her up a 4,000-footer. And then, I’m afraid, the real peak-bagging will begin! If you go: Monadnock is what it is. Legend has it this popular peak near Jaffrey is the second-most-climbed mountain in the world, second only behind Mt. Fuji in Japan. You’ll have more luck finding solitude in a public pool than on Mt. Monadnock in the summer. However, the mountain is popular for a reason. It’s challenging, there’s a variety of terrain and if you don’t care about sharing your day with others, nothing can beat this state park. And, with more than 40 miles of trails, I’d bet if you ask around, you could find some great uncrowded trails. Janelle and I took one of the most popular routes, the White Dot to the White Cross, 4.5 miles total. But the variety of trail options is tremendous and appropriate for any level of fitness. Want a challenge? Try the Pumpelly Trail from Dublin Lake. Good rock scrambles? The Spellman Trail off Cascade Link fits that bill.